Winter & Spring 2019 Tokyo Charity Events - Tickets and Save the Dates! Home / Events / Charity / Winter & Spring 2019 Tokyo Charity Events – Tickets and Save the Dates! Winter & Spring 2019 Tokyo Charity Events – Tickets and Save the Dates! Here is a great list of Winter & Spring 2019 Tokyo Charity Events to support! Attending one or many of these events is a great way to contribute while having fun with new and old friends. If you have other charity events to recommend, please submit here. Please consider attending at least one of the following events this Winter and Spring to support the great work these charities do for our local and global communities. Remember give back, and/or pay it forward. If you are looking to get more involved in a charity by volunteering, then check out all the great opportunities in Tokyo. 1. 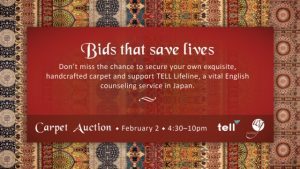 TELL & TAC Women’s Group Carpet Auction, Saturday, February 2, 2019 – A great opportunity to purchase a unique oriental carpet that can make that special statement in your home or office, while also doing something good for young people in the community at the same time! 2. Shine On! Kids Gala, Friday, February 8, 2019 (Tokyo American Club) – Get ready for an evening of soul-warming blues and jazz filled with magical music surprises! Straight from New Orleans, Washboard Chaz and the Steve Gardner band will keep you dancing till the wee hours. Our fabulous Facility Dogs and Program Participants will share uplifting stories while you bid on auctions and enjoy the pre-Mardi Gras mood! more details coming soon. ShineOn! Kids dedicated to making life better for kids with cancer and other serious illnesses in Japan and their families. Shine On! Kids (formerly The Tyler Foundation) was incorporated as a Non-Profit Organization under the laws of Japan in July 2006 and has been supported entirely by private and corporate donations. The creation of the organization was inspired by the smiles and courage of Mark and Kim Ferris’ son Tyler, who spent much of his short life battling a very difficult-to-cure kind of leukemia. After they lost Tyler, they realized there were many ways to take Tyler’s struggles and their experience and create something positive for families going through what they had endured. While the level of medical treatment in Japan is one of the best in the world, the area of patient support is still relatively undeveloped. The organization hopes to redefine the concept of patient support in Japan to create a complete patient support system: from the moment of diagnosis, throughout treatment and even after discharge from the hospital. 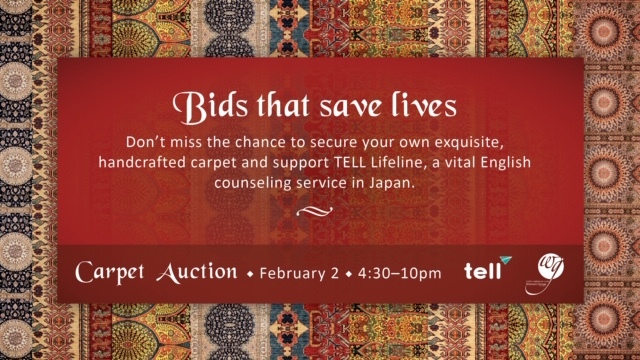 Tickets: 30,000 JPY / person; 250,000 JPY yen per table (10 people) Includes: Cocktail reception, Live Auction, Silent Auction, live musical performances by Washboard Chaz and Steve Gardner Band, program participants speeches, and much more! An evening of extravagance, fun, celebration with networking opportunities, great auction items and entertainment. On International Women’s Day we celebrate the achievements of millions of women living in displaced communities. Lots more details to come. RIJ is an independent non-profit organization that funds projects for people displaced by conflict around the world. RIJ supports projects that provide opportunities for people to lead an independent normal life while staying near to home and their loved ones; projects that enable people to give back to the community and make valuable contributions to the local economy as well as rebuilding their own future. A Shared Commitment for a Cure – Pink Ball is the Foundation’s biggest charity event of the year, and this year we celebrate our 17th anniversary. This year’s black-tie gala will be taking place on Saturday, March 9th, at The Westin Tokyo. All proceeds raised will go towards the Foundation’s community outreach programs including The Lemon Project seminars and publication of PiNK, our quarterly bilingual magazine for women’s health. All of our programs are developed and carried out free-of-charge to improve the QOL of breast cancer patients and survivors, as well as to raise greater awareness in Japan – both in the Japanese speaking and international communities. 5. The Asian University for Women 10th Annual Fundraising Event, March 14, Thursday – The Asian University for Women & Friends of AUW Japan are please to invite you and your guests to the Ninth Annual Fundraising Evening with this year’s key note speaker, Dr. Sachiko Kuno, President & CEO of S&R Foundation. Come to listen to her story first hand at the Asian University for Women on March 22nd! There is also raffle to raise scholarship money with amazing prices. Please buy some raffle tickets even if you can or can not attend. Hotel Gajoen for a special evening of fun and entertainment to celebrate St. Patrick’s Day in Japan. Next Best of Setsubun, February 3rd – Read, Go and Make!